A few images taken at the annual Cafe Racer Day organised by the Oxford Branch of the NOC and this year held at The Red Lion in Cassington. Stan Dibben and Ken Sprayson (The Frame Man) kindly judged and presented the prizes for Best Cafe Racer (Featherbed framed Triumph Trident engine) and Furthest Travelled Cafe Racer (Norton Atlas – Southampton). The “winning” bike was a true masterpiece incorporating an abundance of specially designed and self made components. Bikers turned up from many parts of the UK either to enter their bike or simply to attend. This is the 5th year the event has been held and will almost certainly take place next year at the same location. Many thanks to Janice Bowerman-Faulkner of The Red Lion for hosting the event, members of the Cassington Sports and Social Club for manning the bbq and dispensing coffee and tea and to Stan Dibben and Ken Sprayson for gracing us with their presence, judging and presenting the prizes. The number of attendees was down on previous years, no doubt due to the weather forecast but the 60 or so present all enjoyed the day. 4 VOC members turned up and thoroughly enjoyed the event. Mark the event in your diary for September 2018. Members – please be advised of the following event. 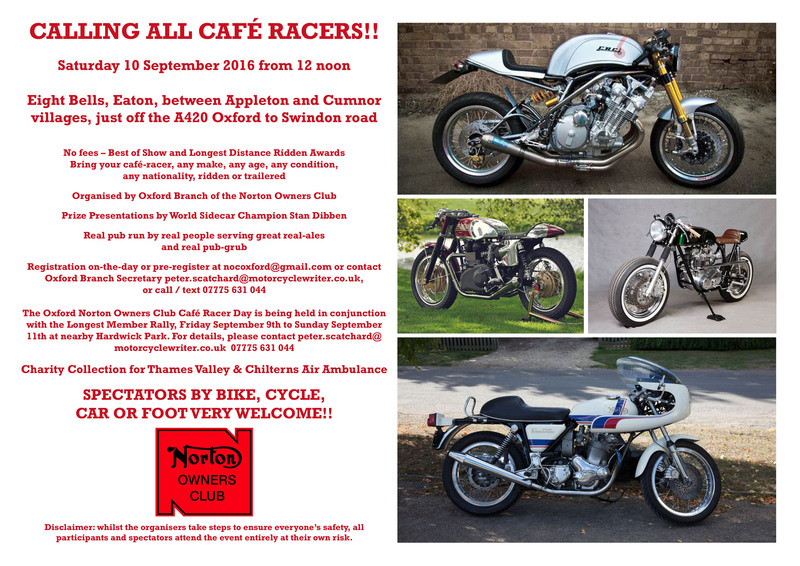 “For some years now the Oxford Branch of the Norton Owners Club has hosted a Café Racer Day in September – this year it is being held on Saturday September 16th 2017 at a new venue, The Red Lion pub in the middle of Cassington village (OX29 4DN). This venue is well known for its annual Bike Night to which literally thousands of bikes turn up in June. Cassington is just off the A40 Witney road, west of Oxford, east of Eynsham. Café Racer Day officially starts at noon, and wraps up around 3 p.m with a short prize-presentation for Best Bike and Furthest Ridden café-racer. A very catholic view of what constitutes a café-racer is taken, broadly defining this as a bike with handlebars that end up below the top-yoke, but even that’s not rigidly adhered to if the rest of the bike conforms to what most view as café-racer style!! There is no charge for entry or admission, but there will be a collection for the Thames Valley and Chilterns Air Ambulance Service or similar ‘bike-oriented’ charity. If you have a café racer your’d like to bring along, ridden or by van / trailer matters not, or if you’d just like an outing to view some lovely customised and highly individual bikes, just come along and enjoy. Come alone or with friends, bring the family, come by bike, car, pushbike, walk or use public transport, we’re easy!! Members – this annual event is being held this Saturday so why not fire up the Velo and enjoy the day. This coming Saturday looks set fair for hot and sunny weather so we should get a good turnout of British and non-British bikes. As in previous years all and any British bike is welcome to park up in the garden of the Red Lion, whether ridden by a club member or not. I would like to stress that all Brit bikes are welcome to park in the garden and not just Triumphs….which this year is the featured marque. If you have a choice of motorcycle in your garage then bring the Trumpet – It will be very interesting to see how many we actually get. If you are a club member but decide to ride a non-Brit bike then please park up outside the pub, the garden is only for Brit bikes. Your BMRCO club membership runs out on June 30th so do take this opportunity and bring along your membership card and £7.00 and renew on Saturday. Ken Drinkwater (our Membership Secretary) will be there all day to stamp your card (proof of payment) and take your money. On Saturday January 21st 16 members/wives/guests enjoyed a lovely meal together at The Red Lion in Northmoor. As expected the noise level rose to crescendo level at times as we all tried to speak. Most of us are slightly deaf so that does partly explain it. It was a wonderful opportunity to develop our friendship and make new ones. 16 is the maximum number the RL can accomodate in their dining room so next year we may need to find bigger premises…her’s hoping. Members – please be advised that the CRD will now take place at The Vine in Cumnor (same venue as last year) not at The Eight Bells as indicated in a previous post. All other event details as per the previous post. The change of venue was forced upon the local branch of the NOC due to the events beyond the control of the Eight Bells. The now annual Cafe Racer Day is once again taking place in September. Please note that it is taking place at The Eight Bells in Eaton (the same location as 2013 if my memory serves well). Those VOC members who have attended this event in the past have thoroughly enjoyed themselves so let the good times roll and get along there. All relevant details can be found on the poster….. Washed your hair, mowed the lawn and cut the hedge? Need a destination on Saturday afternoon July 16th for a ride on the old nail? 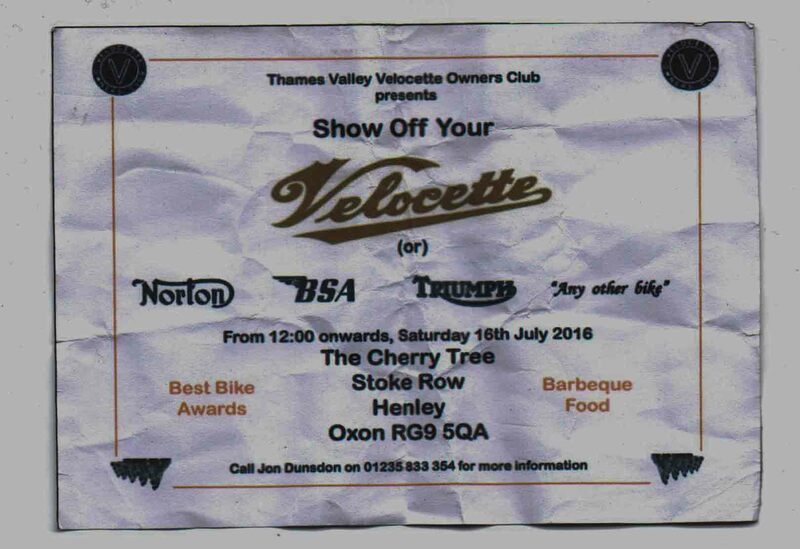 We have been invited to ride over to Stoke Row and Show Off Your Bike at the annual get together of the Thames Valley Centre of the Velocette Owners Club. Lots of loverly black and gold beauties to behold. Other colours are available. I for one will leave the Shire and pay a visit, maybe see you there? Stoke Row is very easy to find (close to Woodcote) and The Cherry Tree is the only pub in town. 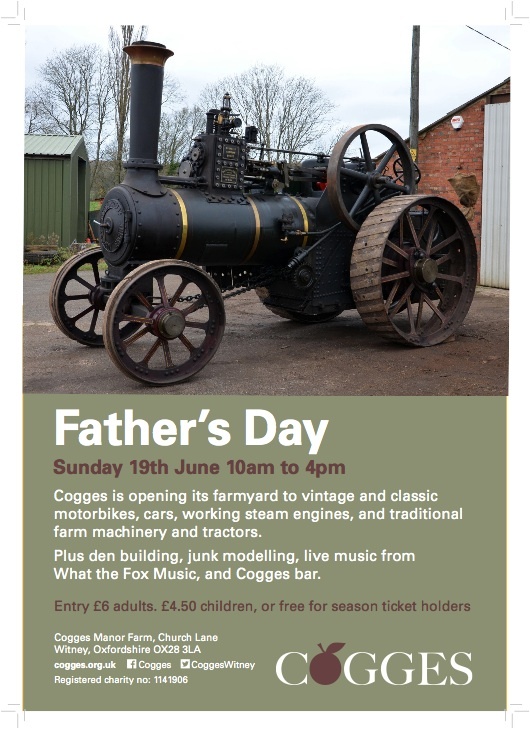 Cogges Farm Museum are holding their inaugural Classic Car, Vintage Bike and Steam Day at Cogges Farm Museum on Sunday June 19th 2016 ( Fathers Day) and our club has been invited to attend. I have spoken with the organiser of this event and she would very much appreciate us bringing along our motorcycles. The museum is a wonderful place for children of all ages and it is really trying very hard to broaden it’s appeal and raise money. They hope to get a good selection of relevant cars, motorcycles, tractors, steam engines, farm implements, stationary engines etc etc so it should make for an interesting day for all concerned. This event is a local event and gives us the opportunity to support a very worthwhile institution and make our club known to other motorcyclists. If you are interested please contact me or simply turn up at the vehicle entry gate at the museum before 10.30 or so and park up on the right hand side. We have an area protected from the weather. There should also be a number of motorcycles from the BMRCO. This does give a good opportunity for us to display our wonderful Velocettes, I will be taking my MAC. For more details of Cogges Farm Museum and it’s location click on the link below. There are a number of activities being organised by the BMRCO to which all members of the VOC are invited to take part. Sunday April 10th – A run to the Super Sausage nr Towcester starting at 09.30 from Red Lion in Cassington. For more details of any of the above events please check out the relevant Information Posts on the BMRCO website British Motorcycle Riders Club Oxford or contact Graham Lay. Well in excess of 50 motorcycles turned up for the 2015 VMCC meet-up at the Red Lion on Boxing Day. A wide variety of machines parked up from the modern to the distinctly old and unusual (a v-twin Burney of 1925?). I met another rigid MAC enthusiast who although a lapsed VOC member may well visit us in due course. Most of the riders left at 12.00 noon, some proceeding to The White Hart at Fyfield and for those interested later to the Ron Amey Trial at the neighbouring village Besselsleigh. It is most heartening to see this long standing tradition (VMCC Boxing Day meet) continue even after having been denied it’s previous locations in Oxford. Given good weather the meet may even get bigger. 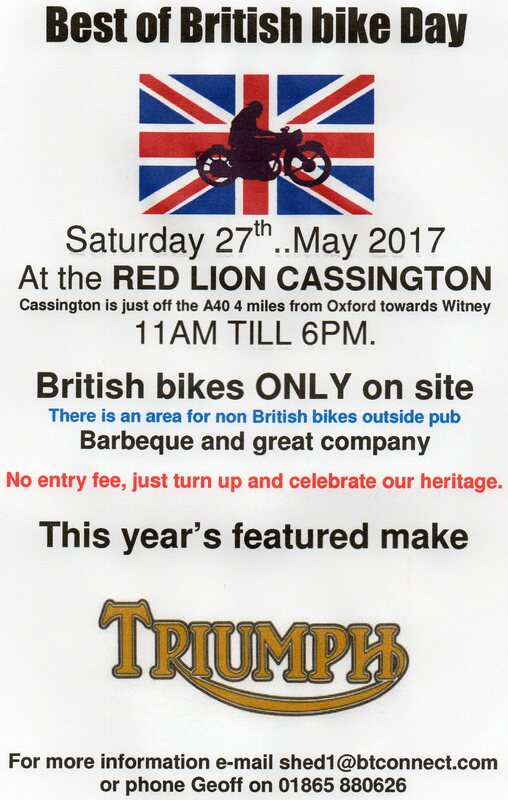 As always the folk of Cassington welcome the holding of such meets even though some are bemused by our passion for old motorcycles.